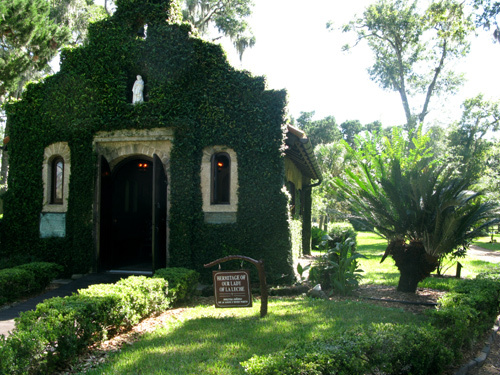 In October Josh and I visited the shrine of Our Lady of La Leche in St. Augustine, Florida. The grounds are beautiful and astoundingly peaceful for what is treated by many as a tourist destination. Inside the chapel we prayed silently. I prayed for myself a little, but mostly I prayed for others whom I wished could visit for themselves. 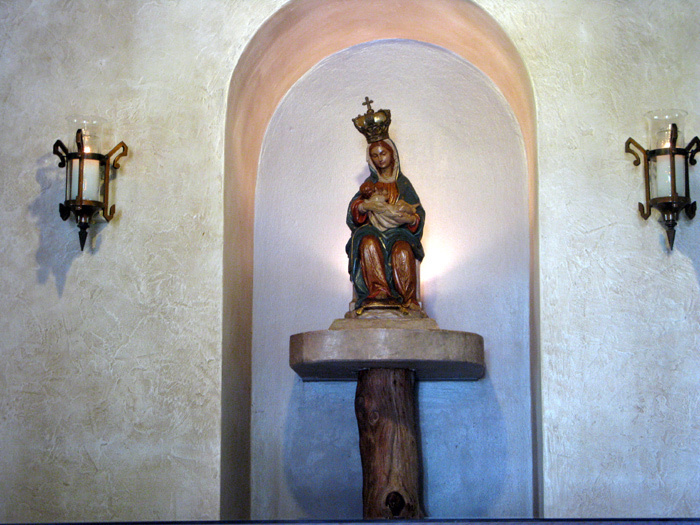 Lovely Lady of La Leche, most loving mother of the Child Jesus, and my mother, listen to my humble prayer. Your motherly heart knows my every wish, my every need. To you only, His spotless Virgin Mother, has your Divine Son given to understand the sentiments which fill my soul. Yours was the sacred privilege of being the Mother of the Savior. Intercede with him now, my loving Mother, that, in accordance with His will, I may become the mother of other children of our heavenly Father. This I ask, O Lady of La Leche, in the Name of your Divine Son, My Lord and Redeemer. Amen. O Lord Jesus Christ, through the intercession of Your tender Mother, Our Lady of La Leche, who bore You close to her heart during those long months before Your birth, I place my baby and myself entirely in Your Hands. Free me, I beseech You, from useless and consuming worry. 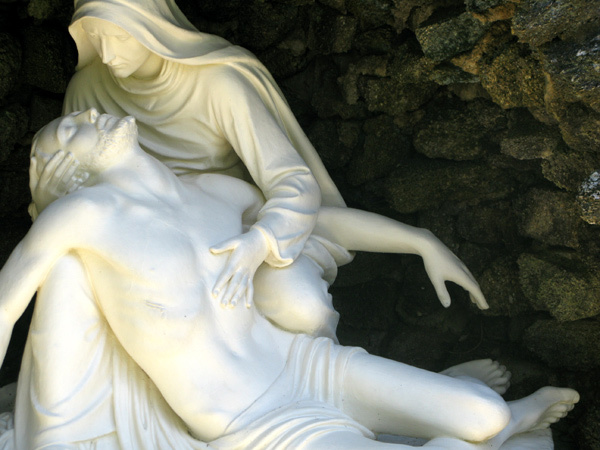 Accept the sacrifice of my aches and pains, which I unite to Your sufferings on the Cross. Above all, most merciful and loving Jesus, protect this child You have given to me from all harm, bestowing the health and vigor every baby needs. Implant in my heart and on my lips the words and prayers of Your Mother and mine, our Lovely Lady of La Leche. All this I ask that my child and I may live to praise forever Your Holy Name. 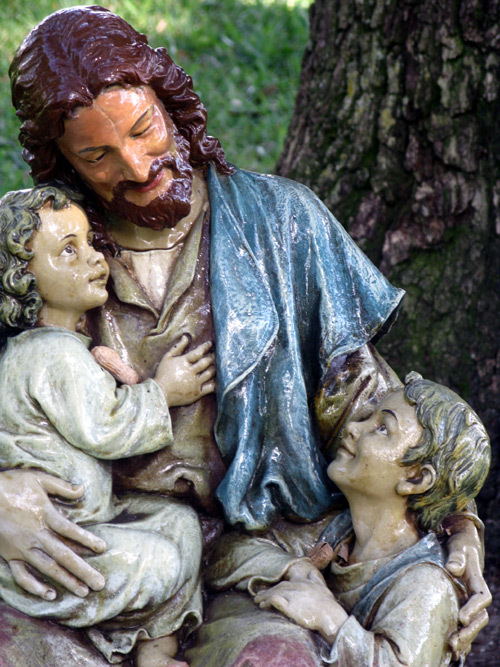 The many sculptures on the grounds did an excellent job of capturing the beauty of Mary worshiping Jesus as her God, nursing him as her baby, and watching him suffer as her savior. It would be difficult to leave the place with a carefree view of motherhood. But even in a place perfect to contain the sorrow of every woman longing to be a mother, there was the joyful reminder of the child born to Our Lady of La Leche: the child who grew up to draw children to himself. He remains the one who draws each of us to himself and offers his mother as the perfect mother for all women, whether longing for motherhood, suffering through motherhood, or entirely oblivious to the wonder that is motherhood. It is truly fitting, Mary, that we should honor you. For God chose to honor you by making you His mother. The prophets of old spoke of you with their fairest praises, the glory of Israel and of all womankind. The angel bowed in reverence as he addressed you who was chosen to be God’s Mother. And all generations have called you blessed. We praise you in your purity, far more radiant than that of the brightest seraphim and cherubim. We praise you in your maternity, in which you were privileged to nourish your God and creator at your breast. We praise you in your virginity, which you kept so preciously together with your holy maternity. We praise you in the honor which through you has been given to holy motherhood throughout the ages. We praise you in the courage your pure and holy example has given to Christian mothers in a sinful world. We praise you, too, in your motherhood, which by God’s decree has made you our mother and us your children. Yes, always and at all times and in all places will we praise and honor and bless you, as it is proper to do, holy Mother of God, ever-blessed virgin, mother of fair love! Those are some beautiful pictures. That is a beautiful shrine! I didn’t know that Mary was the Lady of the Milk – I guess that I learn something new every day! This is such a beautiful post – photos and words! I went to that shrine in college during a habitat for humanity break trip to Jacksonville. It was so beautiful.